Your trailer hitch is not only good for towing trailers - you can also slide in many different types of special racks to handle all your recreational needs. Most of the racks available fit into the larger 2" square receiver, but some bike racks will fit into the smaller 1 1/4" square receiver as well. One thing you must consider is the weight of the loaded rack on the rear of your vehicle. We find with heavy rack items in the hitches, the rear end of the vehicle tends to sag. On heavy scooters and wheelchair lifts this seems to come up quite a bit. Your car may not be equipped to “beef up” the rear suspension to solve the problem, so check before you purchase, just in case. 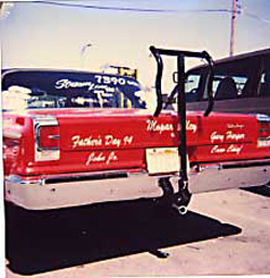 Curt Premium bike racks carry up to 4 bikes for 2 inch and 1 1/4 inch receivers. 2, 3, 4, and 5 bike rack capacity for use with receiver hitches. Kraton vinyl cushions help protect your bike and give additional gripping power. Available in a fold down version. Lockable with your own pad lock of choice. Flexible top plate to accommodate different bike sizes. 2 and 4 bike capacity models. Rack folds up for easy storage or when not in use. Easily adjusts to different bike frame sizes with the simple movement of the wheel holders. New fat tire friendly hoops accommodate up to 3" wide bike tires. Frame "grip arms" have an improved soft-frame friendly coating to protect the bike's finish. Use the ATV Solutions Tilt-A-Rack™. No more trailers or cramped pick-up beds and dangerous ramps to deal with. It tilts for easy loading and has a pull-out extension reducing the incline on taller vehicles. Just hook up the rack to your 2" receiver hitch, load your cycle(s) and you're ready to go! The Cycle Rack is specifically designed for transporting a wide range of Moto-Cross, Enduro, and other "off road" bikes, from pocket bikes to your big scramblers in the 400 lb. range. You can use it behind your smaller space utilized sports vehicles because the Cycle Rack is made of light-weight aluminum and weighs only 47 lbs. You hardly realize it's back there. Models for 1 1/4" or 2" receivers. Use a stabilizer by and stabilize your Cargo Carrier rock solid!